Are you looking for a delicious cake recipe? Something for a weekend treat, dinner party or special occasion? Fancy making this show-stopping Raspberry meringue cake? 1. Preheat the oven to 200°C, gas mark 6. Butter and base line 2 x 20-22cm non-stick, cake tins. Using an electric whisk, beat the butter and 100g of the sugar together in a bowl until pale and creamy, then whisk in the egg yolks, vanilla and milk. Sift over the flour and gently fold in. Divide equally between the prepared tins. 2. Using clean beaters, whisk the egg whites in a bowl until they form soft peaks. Gradually beat in the salt and remaining 200g sugar to make a glossy meringue. Spread over the sponge mixture then scatter over the flaked almonds. Bake for 15-20 minutes until golden and set. Leave to cool in the tins. 3. When ready to assemble, remove the cakes from the tins. In a bowl, whisk the cream to form soft peaks. Spoon over one of the cakes and scatter over the raspberries. Top with the second cake and dust lightly with icing sugar before slicing and serving. Using golden caster sugar gives your raspberry meringue cake a subtle caramel flavour and golden colour. 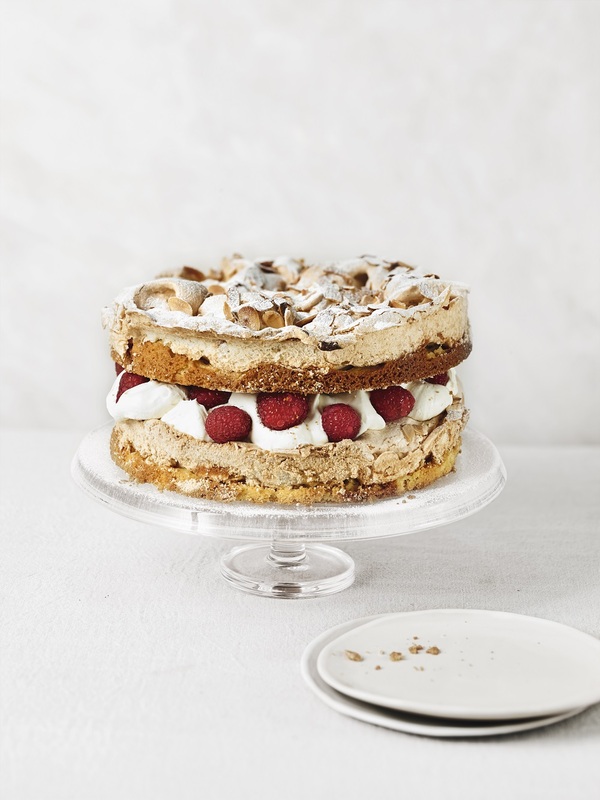 What do you think of this Raspberry Meringue Cake recipes? Bonne Maman Marbled Fruity Meringues. Speedy Strawberry Yogurt And Meringue Mess. "Chinese Chicken And Potato Stir-Fry"
"The Paleo Foods Co. Spiced Almond Milk Hot Chocolate"